Some Moved On, Some Moved In And Made A New New Orleans Post-Katrina recovery varies with each neighborhood. In some, residents never returned. Others have seen an influx of newcomers, creating a different mix of people who now call the city home. Ten years after Hurricane Katrina, New Orleans today is smaller than when the storm hit, with 110,000 fewer people than the nearly half-million who had lived there. But the city's recovery is a story that varies with each neighborhood. In some neighborhoods, like the Lower Ninth Ward, many residents never returned. Others, like the French Quarter, have seen many newcomers and now have more households than they did in 2005. With new residents, a different mix of people now calls the city home than before the storm. Proportionately, the number of whites has risen while the number of black residents has gone down. There are 100,000 fewer black residents in New Orleans than before Katrina. African-Americans now account for less than 60 percent of the population. That's down from two-thirds. And that has changed the culture of the city. "You can't even hear the same dialect that you used to hear," says Stan Norwood, a barber and leader of a community group in the Freret neighborhood. After spending so much time in Houston after evacuating during Katrina, Norwood says he's even lost some of the city's distinctive drawl. "The drag? The New Orleans drag? It's hard to find," he says. After Katrina, Norwood says, many elderly were unable to return to flooded homes. Because the schools were in disarray, some families with children moved to other cities and decided to stay. Others found, even with federal assistance, they didn't have enough to return and rebuild. And now, Norwood says, those who still want to return to the old neighborhood find houses have been priced out of reach. "Put it like this," he says. "If you don't own a property by now and you're originally from this city and you're from Uptown and you haven't had one by now, your chances of getting one are slim to none." Housing prices in Freret have more than doubled in recent years and new businesses have transformed the main drag. Freret is just a stone's throw from two universities, Tulane and Loyola. In the years before Katrina, crime was a problem and many storefronts stood vacant. 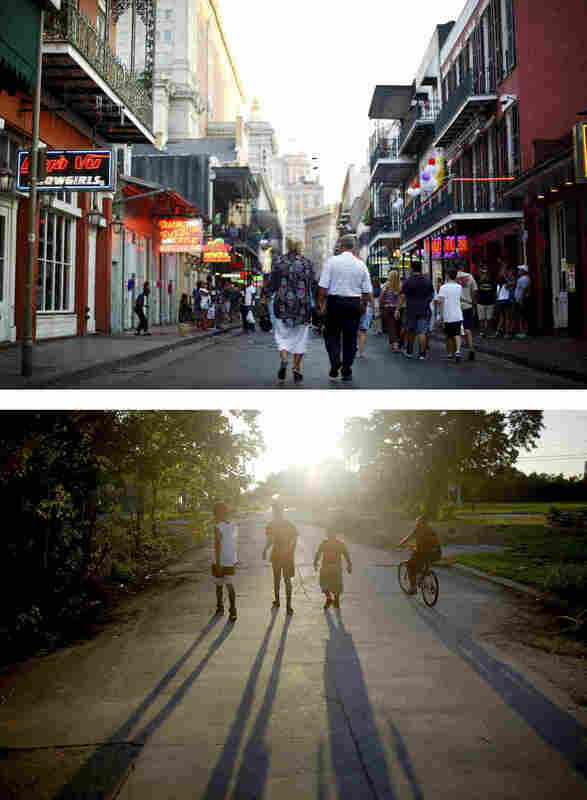 Now, the area is a prime example of New Orleans' revitalization, post-Katrina. Kellie Grengs lives on Freret Street just a few blocks from where Norwood cuts hair. She points to buildings in this reborn business district. A former storage building is now Mint Modern Bistro, a Vietnamese restaurant that opened not long ago. "We have a coffee shop down on the corner that was an abandoned bank," she says. And Dat Dog, a hip hot dog stand, took over a building that once was a gas station. Grengs and her husband, Andy Brott, are both artists who bought a building in the neighborhood before Katrina. The storm turned their investment into a teardown. In its place they built a three-story townhome and studio. And they turned their attention to the neighborhood. "After Katrina," Grengs says, "we had probably 30 to 35 percent of our housing stock vacant, blighted, trashed and ruined. So we kept just telling everyone, 'Please just come back to our neighborhood.' "
To encourage development along the neighborhood's business corridor, the city eased restrictions and streamlined the regulation process. New businesses began opening, including restaurants and a high-end cocktail bar that drew new people to the neighborhood. Business owners branded it the New Freret. That didn't sit well with some longtime residents who feel that changes were leaving them out. Dennis Sigur has owned a barbershop on Freret Street for more than 40 years. "They forgot about the old Freret. That's what happened," Sigur says. 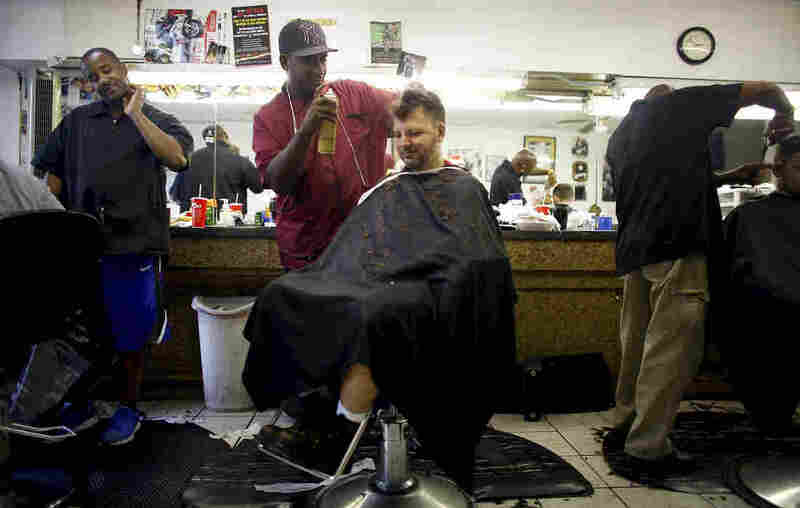 Norwood works at Sigur's barbershop, and he's also the president of Neighbors United, a group that tries to bridge the gap between the newcomers and longtime residents. Norwood welcomes the growth but worries many of the changes are leaving the old neighborhood behind. 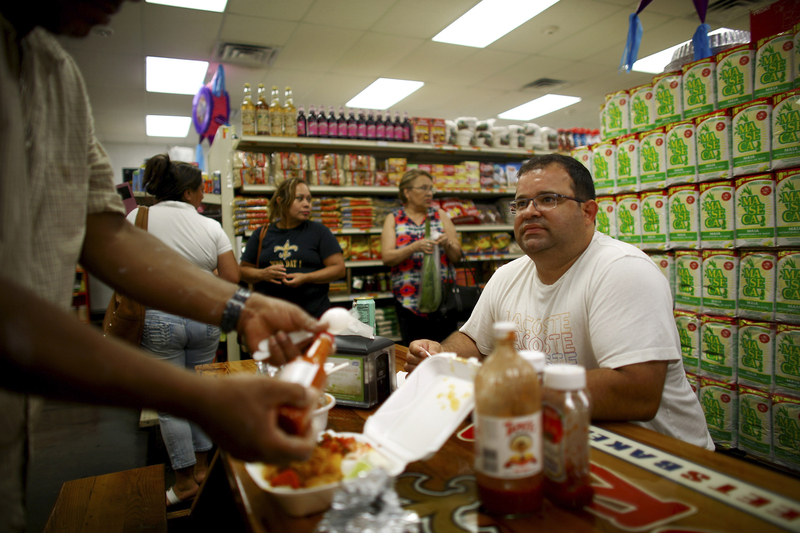 Few who grew up in Freret, he says, can afford to eat in the new restaurants. He recently led a petition drive fighting a proposal to assess households $300 to pay for improved security. "I want what's fair for everybody," he says. "If it helps with new folks, I also want it to also be helpful to all the people that were originally here. Respect them. Because they made this community what it was." Computer software designers and engineers gather for a "hack night" at the Capdeville bar and restaurant in New Orleans. The city has a fledgling tech industry. Allison Plyer with The Data Center, a research group in New Orleans, says gentrification and the high cost of housing have become issues now for a simple reason: New Orleans is growing. That's a change from the years before Katrina when the city was steadily shrinking. "Cities have two choices," she says. "We can either grow jobs and population and then we're going to have newcomers. Or we're going to lose jobs and population. And we know what losing jobs and population looks like, and I don't think anybody would like that very much." The white population in New Orleans is still lower than before the storm. But the percentage of whites in the city has risen, bolstered in recent years by new arrivals, many young and educated. One of the industries attracting them to the city is a small but growing tech sector. 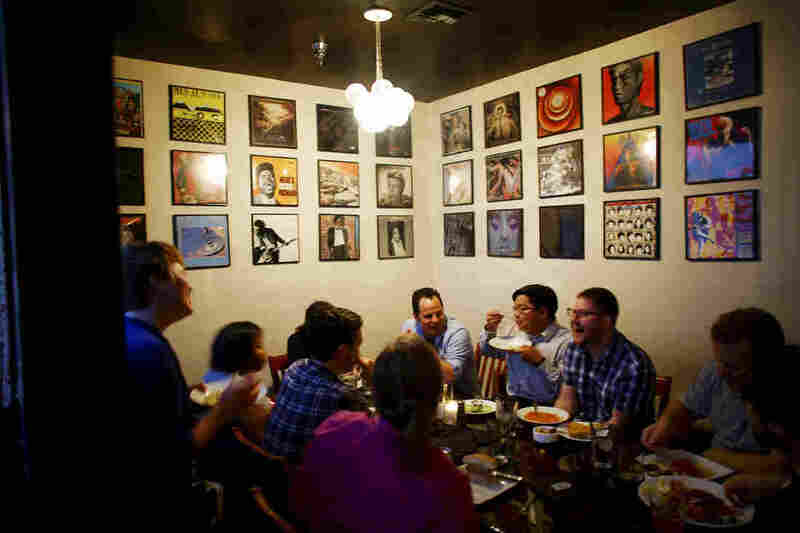 At a trendy downtown bar, there's a weekly meet-up called "hack night." Homegrown and transplanted programmers come to drink craft beers and talk shop. Alyson Kilday moved to New Orleans six years ago with her partner and together they started a graphics and design business. She sees something special going on in the city. Young people want to be part of the comeback here. "I think we're going to look back at the last five, six years and say, 'We were there. We were part of that,' " she says. Jose Castillo, manager of Norma's Sweets Bakery, sits in the shop's dining area. But another group of newcomers began arriving immediately after the storm. The Hispanic population in New Orleans has grown by almost a quarter following Katrina and even more in surrounding parishes. Many of the Hispanics who live and work in the area came here from other parts of the U.S. Jorge Giron is one of many Hispanics taking English language classes given by the Catholic Archdiocese of New Orleans. He's originally from Honduras but came to New Orleans from California after Katrina to work. Now he says he's working on improving his English. "If I speak better English," he says, "I'll get better jobs." Estimating the number of Hispanics who live in New Orleans and surrounding parishes is difficult, in part because so many are undocumented. Carolina Hernandez is with Puentes New Orleans, a nonprofit that works with the community. What many seem to have forgotten, she says, is that after Katrina, Hispanics literally rebuilt the city. "Latinos were everywhere. They were picking up trash. They were fixing the streets. They were putting roofs on, putting blue tarps on roofs," she says. "And so for anyone to say that New Orleans would be anywhere where it is today without the Latino community, they don't understand what really happened." Joel Munguia (center), owner of Chino's, a barbershop in Kenner, La., sits with his nephew, Waldyn Munguia (left), as they have a laugh outside on the waiting benches at the shop. Munguia came to New Orleans from Honduras in 2005 after Katrina and opened his dream shop for Latino hairstyles in 2012. Many of those workers stayed and opened their own businesses. The town of Kenner, in the suburbs, and the Mid-City neighborhood in New Orleans, have become known for their Latino restaurants and markets. Norma's Sweets Bakery opened in Mid-City after Katrina to serve the growing Hispanic community. Manager Jose Castillo says one of the bakery's big sellers is a Latino take on a New Orleans' Mardi Gras classic, the king cake. It's filled with guava and cream cheese. "We've had a lot of success with the king cake," he says. "There was one year that we actually stopped doing it just because we couldn't keep up with the king cake." New Orleans has always been a place that blended cultures. Now, as the city grows, newcomers are adding flavors to the gumbo.